Our Fabiola Tile stencil is a great choice for a trendy makeover! Based on traditional Portuguese Azulejos tile designs, this tile stencil is perfect for creating a gorgeous accent wall, kitchen tile backsplash, stenciled staircase, table top or floor! This spanish tile stencil works great for traditional and contemporary room settings - just use various color combinations. The most trendy color combos include soft greys and taupes and also variations of traditional deep blue color. Use stencil brushes for a multi-color look, or simply roll with a dense foam roller for a monochromatic effect. This stencil will definitely make a statement in your space! You can create really stunning stenciled stairs with this tile pattern! 6" size fits risers on most staircases. We offer this tile stencil in 3 sizes, just like the real tiles: 6", 8" and 12". 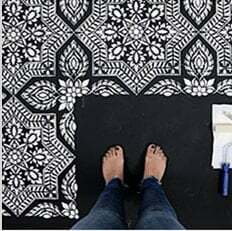 Larger tiles are best for the stenciled floors, but will look great on a wall too. Use smaller tiles for the backslashes and stenciled stairs.